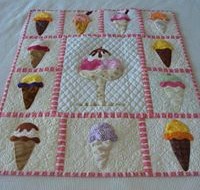 You may choose your favorite ice-cream flavor when making this Ice Cream Treats Block. Blackberry, chocolate or maybe pistachio - and serve it in a crisp brownish waffle cone, on a vanilla/light beige background. Yum! Cut your background fabric piece 9" square, complete your appliqued goodie using your preferred method. You will need a 5" fabric of scrap for both your ice-cream choice and for your waffle cone. Embellish as you wish! The image below is the actual size used to make this block. Looks almost good enough to eat, doesn't it?! You may want to make a lot of flavors! Above is the finished quilt made from this block. I love the creative block placement as well as the sashing that has been used. All the contributing blocks were delicious and very different from one another. 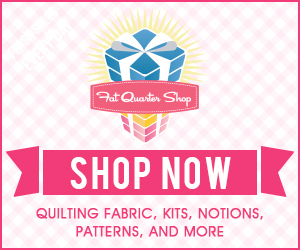 I have listed below some of the embellishments that were made by quilters within our group. This block when made into a children's quilt would be great as a color learner. With a bit of thought I'm sure most colors can be attributed to some sort of ice-cream flavor. 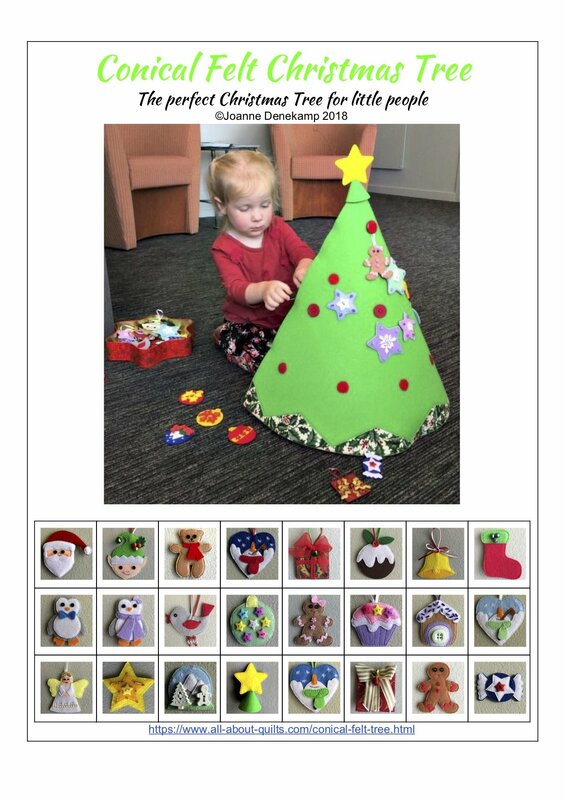 Care with embellishments would be necessary as beads etc for under 3 year olds can be problematic.